Place, we are tethered to it by way of family, culture, myth, personal stories, biorhythms, land. These are some of the tenuous threads that bind us to our home. These strands can be broken by war, cultural displacement, divorce, natural disaster. As an artist I try to reweave these sticky broken threads. BELONGING appears at a critical moment in time, when our connection to place is threatened. Ever since Meridel Rubenstein began her professional career in the early 1980s, evolving from photographer of single palladium prints to multi-media artist of large-scale installations juxtaposing unlikely ideas and highly charged materials, her artmaking has argued for an awareness of how we are connected to place. It strives to bridge ideological distances that alienate us. The dislocation fostered by the tragic events of September 11, 2001, prompted the publication of this thought-provoking book about belonging. According to art and environmental writer Rebecca Solnit, the artist’s role is to expose the familiar in other ways in order “to startle us, wake us up.” Rubenstein, who is the Harnish Visiting Artist at Smith College, and maintains studios in Vermont and New Mexico, does exactly that. Her social consciousness was triggered when, as a student at Sarah Lawrence College in the late 60s, the Vietnam War raged and her desire for everlasting peace found expression, eventually through the medium of photography. Moving to New Mexico for graduate studies she became immersed in a community of experimental artists as well as in a landscape and in cultures inseparable from their past. The earth-shattering impact of Los Alamos, New Mexico, next to Pueblo Indian land, where the first atomic bomb was devised and tested at the Trinity Test Site, inspired CRITICAL MASS, a collaborative photo/video/text installation with Ellen Zweig. CRITICAL MASS premiered at the New Mexico Museum of Fine Arts and traveled to other museums in the country, notably Massachusetts Institute of Technology’s List Visual Arts Center. In addition to CRITICAL MASS, BELONGING is composed of eight distinct and inter-relating sections, each representing an important series or installation that has at its core issues of culture and place. THE LOW RIDERS explores a Hispanic subculture of New Mexico whose cars are designed to reflect their social, spiritual, and esthetic beliefs. LABYRINTHS AND CONSTELLATIONS takes on the locus of myth as place for establishing identity. OPPENHEIMER’S CHAIR is a meditation on nature and the shedding of defensive postures. And the works JOAN’S ARC/VIETNAM, MILLENNIAL FOREST, and TREES AT SEA all refer to Vietnam and to the issues of uprooting and replanting as a result of the war. 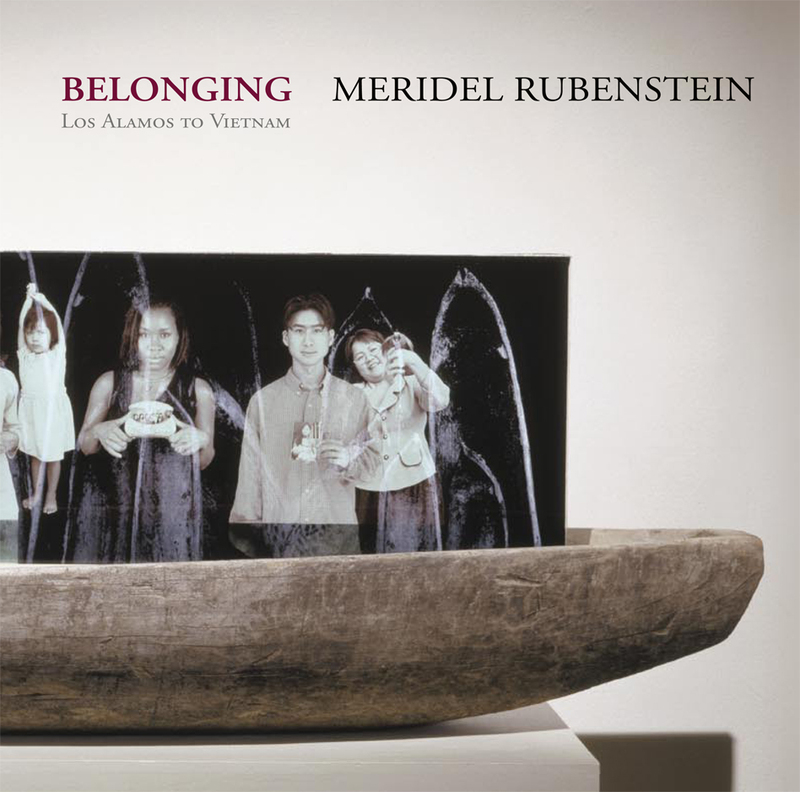 BELONGING is a moving tribute to the multifaceted, provocative, and ever-timely artworks of Meridel Rubenstein. These elegant, light-filled images underscore her profound empathy with and investigation of the often disrupted connection between body and place. James Crump was founding director of Arena Editions, a publisher of fine art photography books. Among his numerous essays and books are works about the photographers F. Holland Day and George Platt Lynes. of art, feminism, politics, and place. Among her recent book publications is On the Beaten Track: Tourism, Art, and Place. Elaine Scarry teaches in the English department at Harvard University. She has written many books, among them The Body in Pain and On Beauty and Being Just, as well as numerous articles on war and the social contract. Terry Tempest Williams is the author of Refuge, Leap, Red and, most recently, The Open Space of Democracy. Among other honors, she is the recipient of a Lannan Literary Award in creative non-fiction. Rebecca Solnit’s book, River of Shadows: Eadweard Muybridge and the Technological Wild West, was awarded the National Book Critics Circle Award. Her latest publication is Hope in the Dark: Untold Histories,Wild Possibilities.